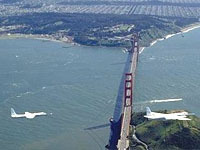 A young American Vudhed Ella became the youngest swimmer, who conquered the Strait "Golden Gate" under the same bridge in San Francisco. For 75 minutes, 7-year-old girl has overcome more than one kilometer of 600 meters. Achieving schoolgirls have already pointed out by representatives of the Guinness Book of World Records. His triumphant swim Ella devoted former educator, recently widowed young mother, struggling with breast cancer. She recently underwent surgery, so a woman can not work now, reports WGD "Voice of Russia" . After a record-breaking swim schoolgirl wrote in the press, moved by the Americans began to collect money to help the teacher. Girl herself admitted that she was very nervous while she was in the water. And after a courageous American swim quickly took a warm shower and went to school. Read: Poisonous jellyfish frustrated record swim . Not long ago, Australian Oliver Wilkinson set a record for the swim around Manhattan - Central New York area, according to "Vesti.ru" . He rounded the island in 5 hours 44 minutes and 2 seconds. Swim starts at the footbridge over the River Harlem. A total of 36-year-old Wilkinson has overcome a distance of 45.9 kilometers, writes UkraNews . Previously reported that the famous British comedian David finished his eight-Uolliams swim in the river Thames. Star of the show "Little Britain" came down to swim in the tidal section of the river. He managed to overcome 225 km. 40-year-old Uolliams hit the road September 5 from Lechleyda in Gloucestershire - the beginning of navigable Thames.